Everfresh is an influential Melbourne-based studio that has payed a major part in driving the rise of street art in Australia/ The studio counts among its members some of the most respected, innovative and widely recognised underground artists in this country: Phibs, Sync, Reka, Rone, Wonderlust, Prism, Meggs, Meek, Makatron and the Tooth. 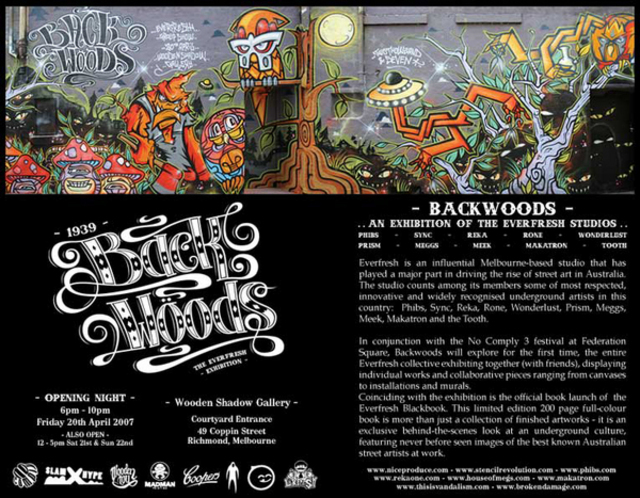 In conjunction with the No Comply 3 festival at Federation Square, Backwoods will explore for the first time, the entire Everfresh collective exhibiting together (with friends), displaying individual works and collaborative pieces ranging from canvases to installations and murals/ Coinciding with the exhibition is the official book launch of the Everfresh Blackbook. This limited editiion 200 page full-colour book is more than just a collection of finished artworks - it is an exclusive behind-the-scenes look at an underground culture, featuring never before seen images of the best known Australian street aritsts at work.